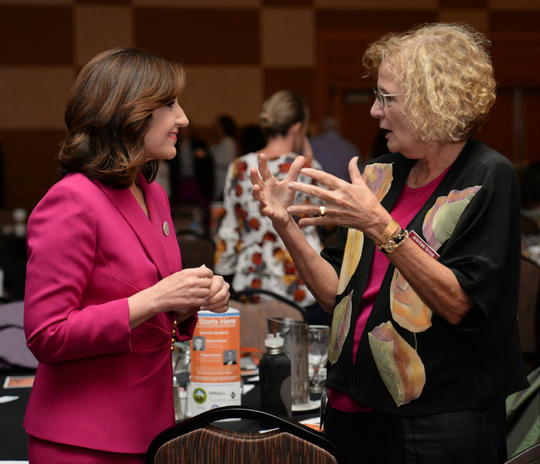 State Superintendent of Public Instruction Joy Hofmeister visits with Shan Glandon from Jenks Public Schools at the statewide Trauma Summit on Oct. 2 in Oklahoma City. To see more photos from the summit, click here. You see the effects of trauma in your classroom every day. Many of your students are facing incredible hardships while their bodies and brains are in critical stages of neurological and physical development. Tragically, trauma can negatively impact health for a lifetime. 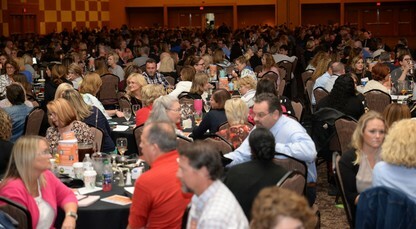 For insight into the latest neuroscience findings and strategies on how teachers can be the difference-maker in taking students from trauma to hope, more than 800 educators and stakeholders attended our statewide summit It Starts Here: Trauma-Informed Instruction on Oct. 2 at the Cox Convention Center in Oklahoma City. 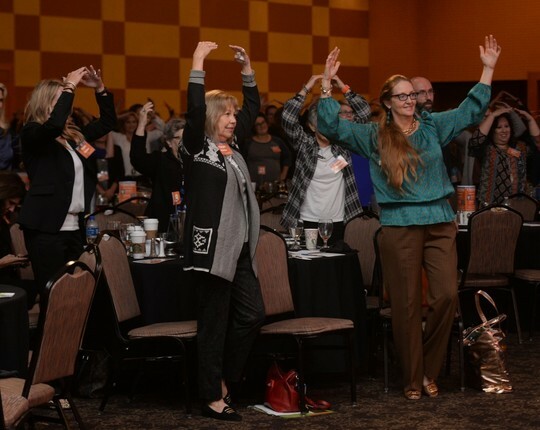 Alliance for HOPE International’s Casey Gwinn shared how to reverse the impact of ACEs with the science of hope, and Steve Graner, a ChildTrauma Academy fellow, taught attendees to “connect before you connect” when managing classroom behavior. Oklahoma will continue to tackle the real-world needs of our students by providing training resources for teachers. Last week, OSDE received three new federal grants totaling $12.5 million to support districts in meeting the mental health needs of their students. If you could not join us Oct. 2, I encourage you to watch the recordings from It Starts Here. Some of the information is as heavy as the burdens your students bear every day. But for so many, you will be the architect building a bridge toward hope. Click here to see the summit and for additional resources on trauma-informed instruction. Educators and stakeholders learn from trauma experts at It Starts Here: Trauma-Informed Instruction. Of the 100 studies requested by Legislators, nearly 40 could impact education in some way. 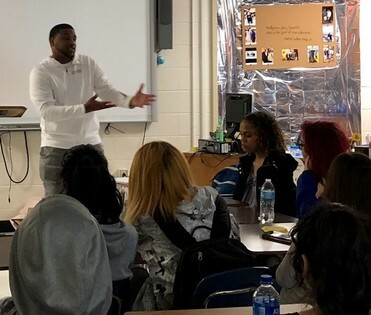 Both the House and Senate Education committees have recently completed their interim studies, and a focus on students who have experienced childhood trauma that may be affecting their behavior at school has emerged. In each of the following study topics, one solution in particular was mentioned – the increased need for school counselors and mental health services in schools. Several other studies focused on the funding and performance of charter schools, and more specifically virtual charter schools, in comparison to traditional public schools. There seems to be a general consensus that as the number of students in charter schools has grown – now approximately 3 percent of public school students – statutes may need to be reexamined to ensure equity not only for charter schools but also traditional public schools. 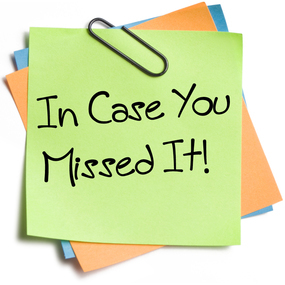 To read the OSDE’s full memo on legislative interim education studies, click here. The Oklahoma State Department of Education (OSDE) is excited to share the Oklahoma Family Guides for English language arts, mathematics, science and social studies for Pre-K through second grade. Additional grade levels are coming soon! The OSDE Family Guides are resources aligned with the Oklahoma Academic Standards and developed specifically for Oklahoma families to complement classroom learning. They illustrate what is expected of students at each grade level in the different content areas along with practice activities that families can do at home to continue a child’s learning experience. Schools and families have important roles to play in helping a child grow socially, emotionally and academically. When schools and families work together as partners, it helps children achieve academic excellence! The guides are a great tool to share during your parent-teacher conferences. To download the Family Guides, click here. The Smithsonian offers an excellent guide, Native Knowledge 360°, that features a number of tribal nations in digital lessons, including respectful approaches to Thanksgiving. The digital lessons can be filtered by subject, tribal nation, grade level, language and region. To see the lessons, click here. 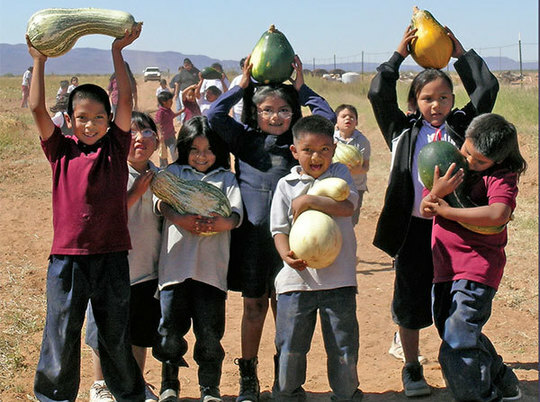 Support organizations advocating for Native American communities. Support the needs of your local tribes. Take time to learn the indigenous history of where you live. Follow the do’s and don’ts below. Do present Native peoples as appropriate role models with whom a Native student can identify. Do present Native peoples as separate from each other, with unique cultures, languages, spiritual beliefs and dress. Do use materials that show the continuity of Native societies, with traditional values and spiritual beliefs connected to the present. Do teach Native history as a regular part of American history and not just for Thanksgiving. Don’t do activities that trivialize Native dress, dance or ceremony. Don’t assume that you don’t have Native students in your class. Don’t do or say anything that would embarrass a Native student. Don’t use books that show Native people as savages, primitive craftspeople or simple tribal people, now extinct. Don’t refer to Native spirituality as superstition, make up Indian legends or encourage students to do “Indian” dances. FREE PD: OSDE’s Office of Curriculum and Instruction is excited to announce free professional development workshops aligned to the Oklahoma Academic Standards across the state. These workshops are perfect for educators looking to identify a new Professional Learning (PL) Focus or deepen expertise in an existing PL Focus. To register and for more information, click here. OSDE will offer additional workshops in January and February. 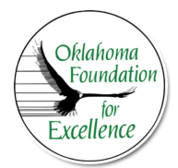 ACADEMIC ALL-STATE: The Oklahoma Foundation for Excellence is seeking nominations for its 2019 Academic All-State Awards honoring outstanding high school seniors and Oklahoma Medal for Excellence Awards recognizing innovative educators in Oklahoma’s public schools. For more information, click here. WESTERN ART CONTEST: The Western Governors’ Association is proud to announce its fourth annual “Celebrate the West” regional art competition that challenges high school students to create works inspired by their state. The entry deadline is April 28. For more information, click here. CURIOSITY FEST: Oklahoma Humanities is offering a limited number of free tickets to high school teachers and their students to attend Curiosity Fest on Oct. 20. University faculty will present in learning formats that are fun, interactive and engaging. For more information, click here. To request tickets, click here. To request free classroom sets of Oklahoma Humanities Magazine, email Carla Walker. What are the latest and best instructional strategies? Robert Marzano, John Hattie and Doug Lemov, three prestigious educational researchers, published findings regarding the impact of instructional practices and ranked them by effectiveness. Instructional practices scored at 0.4 have a medium effect, while 0.8 are considered high. Any strategies ranked at 1.0 or above greatly impact learning. Jan has 40 years of experience in Oklahoma as a teacher, coach, administrator and associate state director of AdvancED. With a southern Oklahoma farming and ranching background and as a rural school graduate, Jan is a strong advocate for rural schools. Putnam Heights Elementary in Oklahoma City Public Schools, which utilizes differentiated instruction in its lessons, was one of the stops on Oklahoma Teacher of the Year Donna Gradel’s “Year of the Teacher” tour. Our young teachers are doing an excellent job – so excellent that neighboring states and the private sector will be knocking on their doors. We must properly fund our education system and provide the adequate tools, acceptable class sizes and support services our students need. If we do, we have a far better chance of keeping our talented younger teachers in Oklahoma where their passions lie. To read more of Donna’s blog, click here. Becky Oglesby, representing Yukon Public Schools, was named the 2019 Oklahoma Teacher of the Year last month. To see more photos from the Teacher of the Year ceremony, click here. A Yukon elementary school art educator whose abundance of comic-book memorabilia in her classroom earned her the nickname the “Batman Teacher” is Oklahoma’s 2019 Teacher of the Year. Becky Oglesby teaches Pre-K through third grade at Ranchwood Elementary School in Yukon Public Schools. 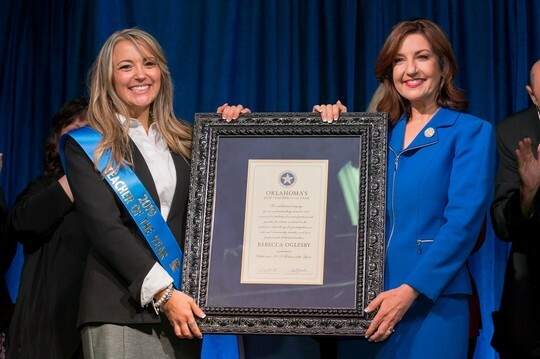 State Superintendent of Public Instruction Joy Hofmeister said Oglesby’s creative teaching style, along with her optimism and passion for education, is a model of excellence for Oklahoma. All first- through fifth-grade classrooms may now apply to participate in the Governor’s Christmas Tree Lighting Ceremony. The event will take place from approximately 1 p.m. to 6 p.m. on Dec. 4 at the Oklahoma State Capitol. 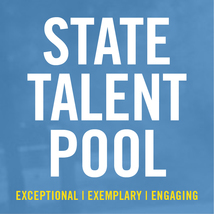 We invite you to apply to be one of the 24 schools participating in this exciting event! Applications are due Oct. 22. For an application and more information, click here. NATIVE YOUTH GRANT: OSDE has been awarded a nearly $4 million federal Native Youth Community Project grant aimed at improving college and career readiness for 1,400 American Indian high school students. To read the story, click here. SCHOOL SAFETY GRANT: OSDE will receive almost $400,000 in grant funding to bolster school security, educate and train students and faculty, and support law enforcement officers and first responders. To read the story, click here. 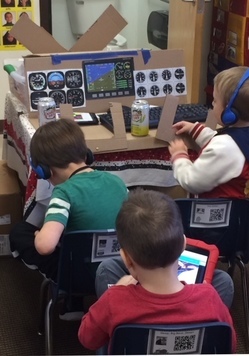 GAINING ALTITUDE: Students as young as Pre-K have been bitten by the flight bug, thanks to an aviation STEM program at Ada Public Schools that ultimately could result in juniors piloting a plane about the same time they are getting their driver’s licenses. To read the story, click here. SCIENCE-FAIR DYNASTY: To get her students interested in STEM, one Byng teacher showed them how science projects can improve their community. To read the story, click here.